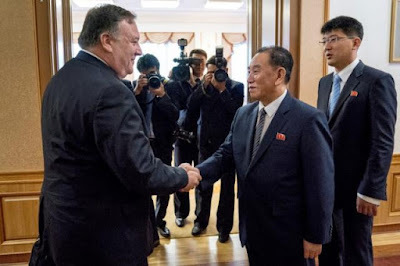 North Korea accused the United States on Saturday of making “gangster-like” demands in talks over its nuclear program, contradicting U.S. Secretary of State Mike Pompeo hours after he left saying the old enemies had made progress on key issues. He said Pompeo’s delegation insisted on unilateral complete, verifiable and irreversible denuclearization, known as CVID. He argued instead for both sides to take a series of simultaneous steps as a “shortcut” to a nuclear-free Korean peninsula. There was no immediate comment on the KCNA statement from the State Department or the White House. The contrasting comments raised questions over whether North Korea is committed to abandoning the nuclear programs it has developed for decades and has seen as key to its survival. Trump and Kim pledged at their June 12 summit meeting in Singapore to move toward denuclearization of the Korean peninsula. Trump has declared on Twitter that North Korea no longer poses a nuclear threat. But Kim has yet to provide details of how or when North Korea might dismantle a weapons program that Trump has vowed will not be allowed to threaten the United States. Also, leaked U.S. intelligence findings concluded North Korea does not intend to completely give up its nuclear program. “These are complicated issues but we made progress on almost all of the central issues. Some places a great deal of progress, other places there’s still more work to be done,” he said, according to a pool report from U.S. reporters who accompanied him to Pyongyang. Some U.S. experts on North Korea said the ongoing disputes show the risk of Washington granting premature concessions to Pyongyang. Many were surprised when Trump agreed at the summit in Singapore to end joint military exercises with South Korea. “They have gotten the U.S. to back off military exercises, back off using ‘CVID’, back off the ‘Libya model’ of rapid denuclearization, back off on human rights, and to look the other way while China relaxes sanctions implementation. The U.S.-North Korea talks are being closely watched across Asia. Pompeo is due to meet in Tokyo on Sunday with his Japanese and South Korean counterparts and Japanese Prime Minister Shinzo Abe.